In a new column, Julie Lorch pedals along with notable members of Philly's bicycle community on a route of their choice. They ride, they chat, she reports back. 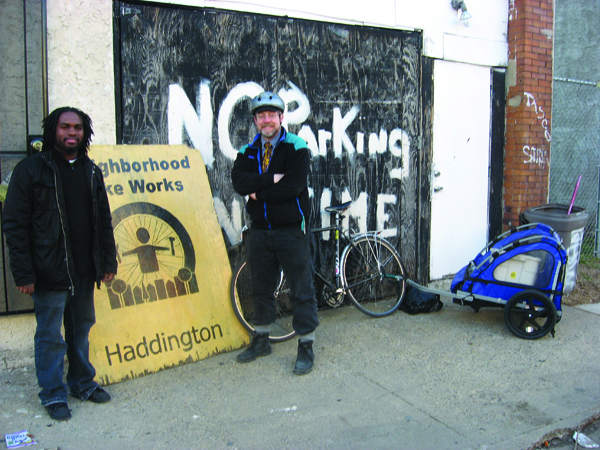 I met Andy Dyson at St. Mary’s Church, Neighborhood Bike Works’ (NBW) headquarters at 3916 Locust Walk. Director of the organization since 2002, Dyson spends his days surrounded by broken bikes and people who want to fix them. You may have heard of Bike Church—a time when NBW opens its doors to adults hoping to fix their bikes under the (totally secular) supervision of volunteer mechanics—but NBW is really an organization about kids. Every year, over 350 young people complete the eight week Earn-a-Bike class and take home a set of wheels they’ve refurbished themselves. It’s a form of stealthy environmental education—pairing the joys of reuse/recycle with adopting a greener form of transportation. NBW also runs summer camps, fitness programs, adult bike repair classes and, with a hand from Cadence Cycles, has started a youth racing team. Recently, Dyson partnered with Temple for a third location in North Philadelphia. Dyson unlocks his bike—which he bought from NBW for $100—while singing the praises of Google Maps, Kevlar belted tires and the all-powerful bike trailer. Dyson loves bike trailers. He thinks if more people felt comfortable using them, there would be fewer cars on the road. “I want our ride to really be in the neighborhoods,” says Dyson. “Philadelphia is a very diverse city full of amazingly different areas, and the bicycle is one way that I’ve gotten to know it.” Dyson hooks up a trailer stuffed with tires, forks and brake parts destined for NBW’s Haddington workshop at 60th and Salford Streets, and off we go. We move over to Sansom. It doesn’t have a bike lane, but it’s wider and quieter than Walnut. Only two cars pass us in eight blocks. 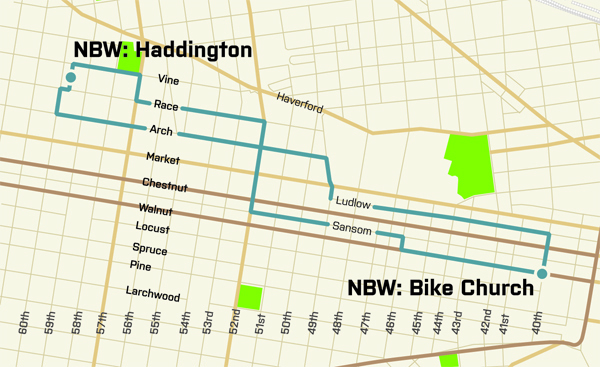 Past 52nd Street, we move further north to Race, which offers one of the most luxurious bike lanes in the city. It’s wide enough for us to ride abreast, and the road is smooth. I immediately feel like a jerk for not knowing it existed. Mustafa Abdul-Rashid greets us at the Haddington workshop. An employee of the program since high school, Abdul-Rashid now works full time for NBW, running the shop at 230 North Salford Street. He also helps kids with their homework before Earn-a-Bike classes and hopes to redo the second floor of the shop to host special events and parties. If you’d like to volunteer, make a donation, or find out more about Neighborhood Bike Works, Bike Church, or the Earn-a-Bike program, visit neighborhoodbikeworks.org. For more information on the Philadelphia Mountain Biking Association, visit phillymtb.org.